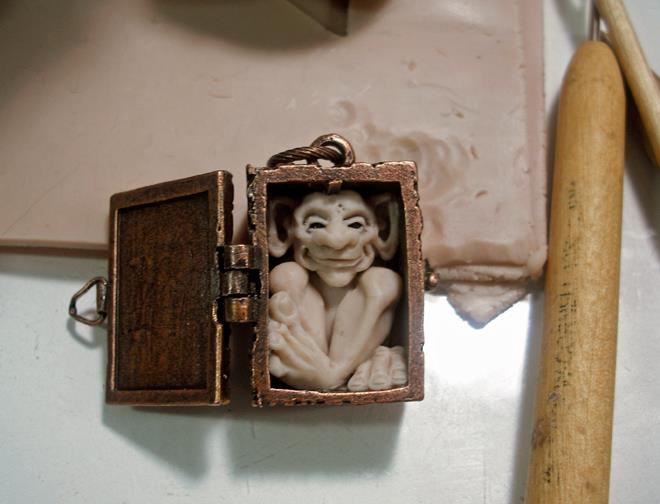 Sometimes it’s good think inside the box as in Dawn Schiller’s latest polymer OddFae tucked in a 1″ locket. Guru in a box? Consultant in a box? Check out more of her work in the June issue of PolymerCafe magazine. Her Faemaker book is due out this August. Read about her latest exploits on FaceBook and Etsy. We all need a whop once in a while. I’m Glad you finished the Fae before someone got to you !! Can’t wait for the book !! Dawn is just so fantastic!!! me too, i can’t wait for her book!! is beautiful and real make me think that I have to think before I do anything. Dawn’s work for me is the slightly darker side of Doreen’s–she illustrates the hidden fairy tales, the creatures peering through the holes in the walls of grandmother’s house–I can’t help but think they are benevolent, though. I Like ’em!